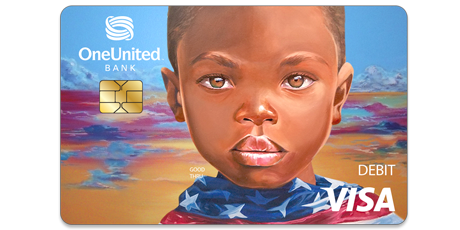 We have unapologetically Black images on our Visa Debit Cards to #BankBlack and show the world that #BlackMoneyMatters. 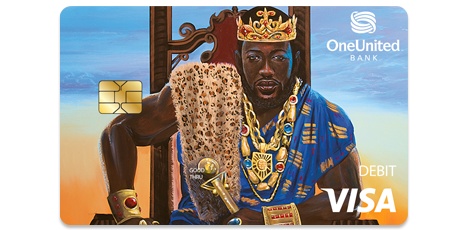 We want you to feel like royalty when you get the card and use it each and every day to make purchases. Take pride in using the power of your purchases to represent, support, and uplift your community. 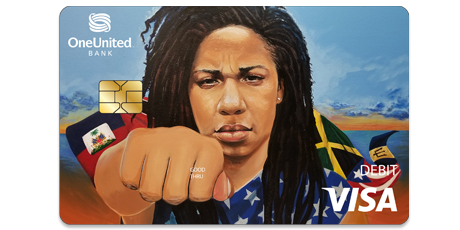 Strong, bold, and unapologetically Black…make a statement with every dollar you spend – or save – using your OneUnited Bank Visa Debit or ATM card. 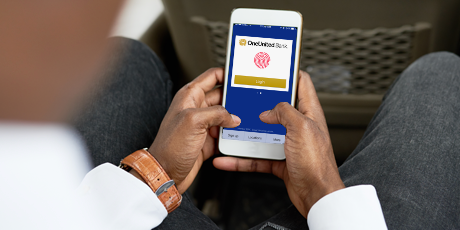 Whether it’s our top-rated mobile app (available for iOS and Android) or great features like Apple Pay, Samsung Pay, Google Wallet, mobile check depositing, or just finding a surcharge-free ATM or branch location, you can trust that we’ve got you covered with our free online banking and mobile banking services. 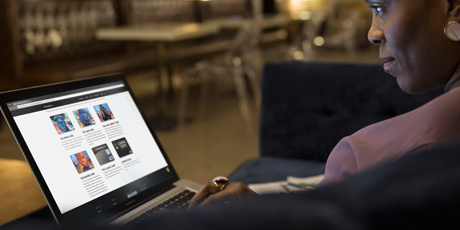 With just a few taps and clicks, you can quickly, safely, and easily manage your money when you bank with us. 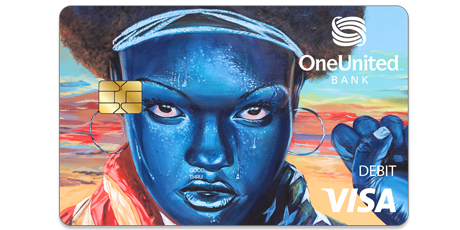 We want you to feel the purpose of banking with OneUnited Bank. 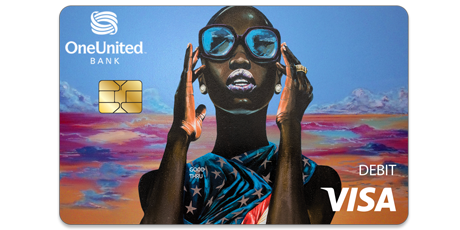 By joining the #BankBlack and #BuyBlack Movement, you are showing the world the power of our $1.2 trillion in annual spending. We offer second chance checking for people with ChexSystems records and our UNITY Visa Secured Credit Card to help rebuild credit. We also focus on financial literacy with our online Financial Education Center and our annual youth I Got Bank Financial Literacy & Art Contest. Together, we can bring Black Wall Street back. 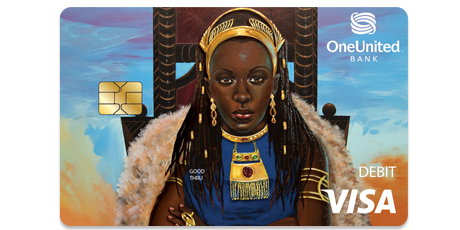 We are America’s largest Black-owned bank. We believe in the transformative power of collective economics and are working to help increase financial literacy and wealth generation within the communities we serve. BankBlack®. Move your money. Join the movement. Through our Mobile App on your iOS or Android device. Avoid monthly maintenance fees any month you have a direct deposit. Get cash surcharge free at over 30,000 ATMs nationwide. Join the Movement. Get the Card. "It was very easy and convenient to open and deposit into my new account. The customer service is fantastic." "Excellent customer service I should have switched banks years ago. GO TEAM!!!" "Friendly service with a smile!!!!" "I couldn't be happier! I feel like I'm doing SOMETHING positive for my community. Thank you!" "The representatives were extremely kind, patient and informative. Great customer service. I definitely enjoyed my interaction." "I opened my account online and it was fast and easy! I love my new bank!" "It has been a very pleasant experience thus far. I`m very enthusiastic about banking with you guys, Thank you!!" "Staff was very friendly and took care of business. I'm glad I opened my account here." "The online sign up was simple. Your website is user friendly. Hope to do a lot of business with OneUnited." "Opening an account online with OneUnited Bank was very easy to do. I'm very happy with my experience"
"Great Bank!!! Opening an account was smooth and quick! I looking forward to moving all my money to One United Bank and doing business with them for years to come!" "Easy to use website. State of the art. I'm so proud to be a member." "I am truly honored to be a part of this tremendous and very important revolution. Thank you OneUnited." "The customer representatives was knowledgeable and fast and very sweet"
"Had to call customer service twice, and had an outstanding experience both times." "Your website was easy to use. Your responses back to me were quick. I am excited to be a member of this bank." "I am proud to be a part of an institution that is economically funding our community!" "Easy process. This bank offers everything my previous national bank does plus more. Never going back!" "Great customer service when I called to get some questions answered. It was very easy to open an account." "It was very simple and easy. When I did have a question the customer service was great." "The staff was very friendly and helped me find the perfect options to fit my needs. Not too mention, the branch itself is so beautiful and welcoming!" "Best and most efficient way to open a bank account online!! Thank you so much!!!" "Everyone was so nice and polite. Very helpful and welcoming. Great experience!" "The account opening process was simple. The customer support team was able to answer all of my questions within minutes." 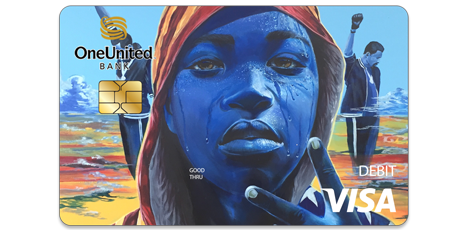 "I love the gold ribbon on the UNITY Visa Card. It reminds me to "follow the yellow brick road" to better credit." "I have used a secured card for nine months and followed the advice and my credit score has increased 90 points." "Quick, easy and simple process to opening an account. Enjoying my experience with OneUnited thus far!"